We’ve all had that moment. Sitting at a red light on dry, empty pavement. The road ahead stretched out for miles on end, dissolving over the horizon, beckoning you, seducing you—to slam your foot onto the accelerator and start speeding. Maybe you’re running late and can’t stand the thought of missing Toyotathon. Maybe you just long to hear the engine roar louder than the wind around you, your vision distorting as your hands clench the wheel and knuckles whiten. The crosswalk timer ticks down as you wait for the light to change. Your heart racing as your lips tremble, then open, and you shakily utter, “Hey Siri, play Danger Zone on Spotify.” Then a split second of inquisition: there’s nothing wrong with a little bit of speeding, right? How dangerous could it be? After all, Olympic bobsledders go really fast. Why can’t I? This is actually a very common question. 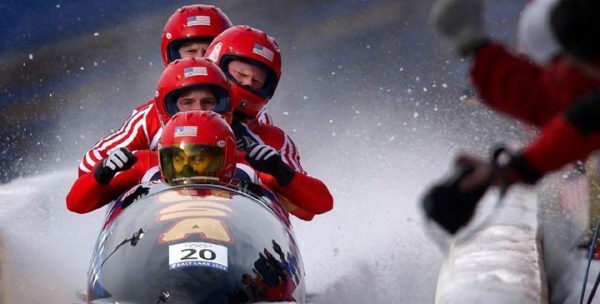 When approached with this topic, most if not all drivers rationalize speeding in a motor vehicle by comparing it to the bravery and engineering, logistical, and co-ordinational ingenuity of Olympic Bobsledding. While not logically or morally sound, this is a tactic employed by many decent folks, most of the time just trying to get to where they need to go and finding ways to justify the means of doing so, regardless of the safety of themselves or others. According to the National Highway Traffic Safety Administration (NHTSA), speeding was the cause of 9,557 deaths in 2015. In contrast, there are only a handful of recorded bobsled deaths at Olympic sanctioned events or training exercises. And this is in a sport that involves drivers and riders in thin, aerodynamic body suits and a helmet, hurtling down an unforgiving, serpentine track at over 90 mph in a light metal-bodied sled they can barely see out of. Even us amateurs with our “airbags” and “seatbelts” operate vehicles at a higher risk of fatality than these brave men and women. Not to mention the risk of injuring or killing someone else at our fault. Setting aside this risk of physical injury or death still leaves us with very little to gain. While an Olympic Bobsledder is paid to represent their country, practice for months and months on end, and stand to win glory, honor, and a priceless medal with some cash, us gas guzzling, rubber tire handling, government safety regulated plebeians stand to win nothing but a few extra minutes wherever we’re going. But more likely, a ticket—or even jail time. It is disrespectful and egregiously offensive to compare our self-conceived prerogative to speed with the prestige of the world’s finest athletes. It is incumbent upon us to yield our most carnal desires; our needs for speeds, to the recognition of the limitation of our abilities. However, when we fall victim to our self-desires of going over the speed limit and we’re slapped with a traffic ticket, there is a light at the end of the tunnel. That light is Myimprov.com. Your traffic school online. You don’t have to succumb to increased insurance rates because you have a ticket. By enrolling into our traffic school online, you can prove to everyone that you are a safe driver. Safe drivers have lower insurance rates and clean driving records. You should stop speeding. But, when you are given a ticket for not controlling yourself, just remember there is a solution.